When Tyson Ross took the mound on April 13th, his ERA was at 5.25. Since that start, Ross’ ERA has not been over 4.0, while going at least six innings in nine of his 11 starts this year. On top of that, in four starts against the Reds in his career, Ross is 4-0 in 28 innings pitched, with 30 strikeouts and a three-hit complete game shutout against Cincinnati in 2014. Ross would continue his trend against the Reds on Sunday. The right-hander got off to a good start, as he got leadoff hitter Jesse Winker to ground out weakly to first and Tucker Barnhart to fly out softly to center field. After perennial all-star Joey Votto hit his first triple of 2018, Ross settled down and got Scooter Gennett to ground out to short to end the inning. In the bottom of the first, a scary moment occurred for the Padres. On an 0-2 pitch, Padres’ rookie third baseman Christian Villanueva had to leave the game after fouling a ball off of his left shin. This is the second time he has done that in this series. The report from the Padres says he suffered a left-ankle contusion and there is no word yet how long he will be out. Cory Spangenberg replaced him, hitting fourth for the Padres. Eugenio Suarez led off the second with a solo home run for the Reds, the first allowed by Ross in his career against the Reds. Ross would settle down though, getting Adam Duvall to pop up to short and striking out both Jose Peraza and Luis Castillo swinging. Ross appeared to be working quickly in the third inning, getting Billy Hamilton to pop out and Winker to ground out softly again, but he then walked Barnhart on four straight pitches. After getting ahead on Votto, Ross allowed an opposite field single to put runners on first and second with two outs. Up walked Gennett, hitting .338, who began the game only trailing Dodgers Matt Kemp for the National League batting average lead. He would ground out on the third pitch to Freddy Galvis to end the threat. Ross would exact his revenge in the fourth against Suarez, getting him to strikeout looking to start the inning. He escaped the inning quickly, getting a couple of ground outs from Duvall and Castillo after allowing a single to Peraza in between. The fifth inning started with a four-pitch walk to Hamilton, who was quickly erased when Raffy Lopez caught the speedster trying to steal second on a tremendous catch-and-throw. The play proved to be huge, saving a run because Winker immediately followed with an opposite field single and Votto would drop a single with two-outs. The hit to Votto was extremely costly as it had a six percent chance of being a hit, according to baseballsavant.com, and it appeared to be a miscommunication by Manuel Margot and Travis Jankowski in left-center field. Gennett followed with a hit to give the Reds a 2-0 lead. Suarez then followed with a flyout to end the fifth. 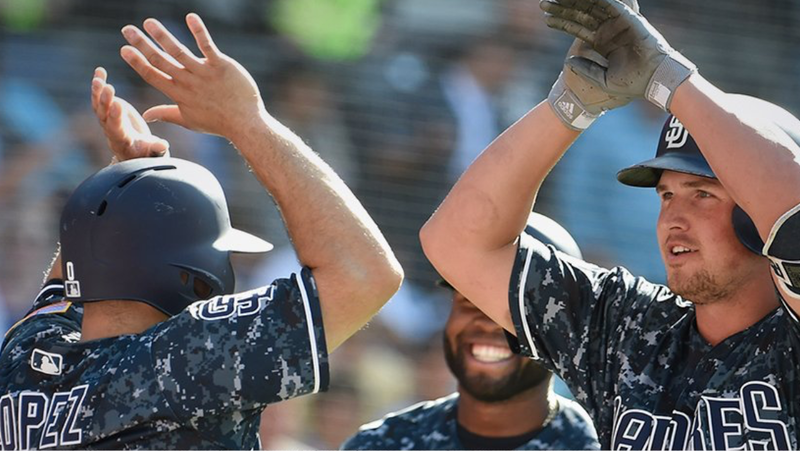 In the bottom half of the inning the Padres’ offense showed life. Big Franmil Reyes started off the inning with a remarkable 10-pitch battle, which led to a single up the middle. Galvis followed with a bunt single to put runners on first and second with no outs. Up stepped Margot, looking to atone for a misplay in the top half of the inning. Margot battled, seeing nine pitches before he walked, the first of the day for the Padres. 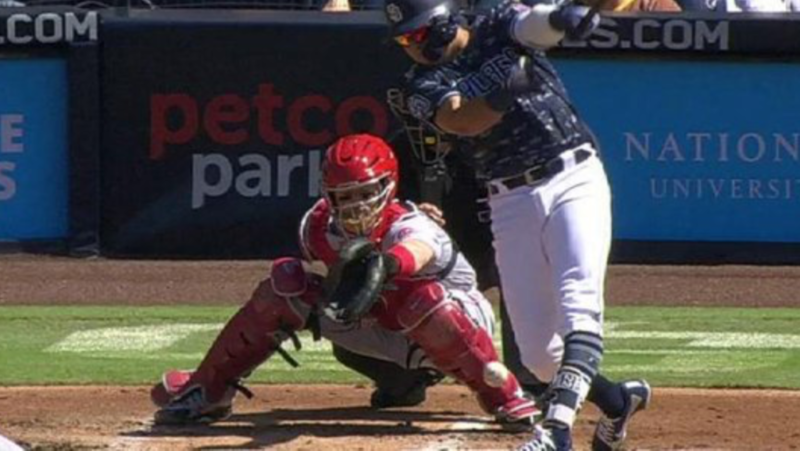 Raffy Lopez walked to the plate with no outs and the bases loaded, but the Padres would not be able to score a run as Lopez grounded out softly in front of the plate, forcing Reyes out at home. Hunter Renfroe pinch-hit for Ross, ending his day. Renfroe fell behind 0-2 in the count before hitting a 1-2 slider over the middle of the plate 375 feet for a grand slam to give the Padres a 4-2 lead over the Reds. Ross’ final line was five innings, seven hits, two earned runs, with three strikeouts. Not his best outing this year, but besides the leadoff home run in the second inning from Suarez, there was not much hard contact. His ERA is now at 3.31 for the year. The Padres added a run in the sixth after a Lopez RBI single, giving them a 5-2 lead. Gennett brought the Reds to within two runs, homering against Brad Hand in the eighth, but the Padres answered back with a Spangenberg solo home run in the bottom half, giving the Padres a 6-3 lead. That would be the final score as the Padres won the series against the Reds. – The Padres are now 5-0 when Ross starts at Petco Park in 2018. – Eric Hosmer continued his hot streak. In the last eight games he has 14 hits in 29 at-bats, getting three hits today, bringing his average up to .289. He has now reached base safely in 20 of his last 22 games. – Margot had 10 walks on the season before he worked a nine-pitch game-changing walk in the bottom of the fifth. The center fielder has slowly been working his way out of his season-starting slump, hitting .294 in his last seven games before Sunday’s contest. He had three walks on the day. – Reyes, for the first time in his career, had back-to-back multi-hit games, after getting two hits Sunday. Franmil has seen his average raise to .235. – Adam Cimber continued his wonderful rookie campaign. The righty pitched a 1-2-3 inning in the top of the sixth, lowering his ERA to 2.93. With the current all-star format favoring relief pitchers, Padres fans should not be surprised to see Cimber possibly make the team; he certainly has deserved it. – Hand entered in the eighth in a non-save situation, facing the heart of the Reds’ order, lefties Votto and Gennett, and right-handed Suarez. He struck out Votto before Gennett homered on the 15th pitch from Hand. That would be the first hit for the Reds against the Padres’ bullpen. Since he was a little kid he wanted to be one of those guys at the game who had the headset on, listening to the Colonel and Uncle Teddy, he has grown out of that, but the love is still there. Padres' coverage will be biased at times, but mostly an honest dissection of the team he loves.